Toyota is fully set to showcase its prowess in the MPV Segment & Hybrid Technology at the Auto Expo 2016. Toyota to also unveil a new technology initiative to further delight & connect with customers. As the countdown begins to the much awaited ‘Auto Expo 2016’, Toyota Kirloskar Motor (TKM) has its pipeline brimming. Built around the theme Mobility Evolution through “QDR” (Quality, Durability & Reliability) & Advanced Technology, Safety & Environmental contribution, Toyota has two big product launches lined up to showcase its prowess in the new generation MPV segment and passenger car segment with special emphasis on hybrid technology. Toyota will also be launching a breakthrough technology initiative which will further add to customer delight. We already know Toyota is creating a lot of buzz with its next generation Innova. 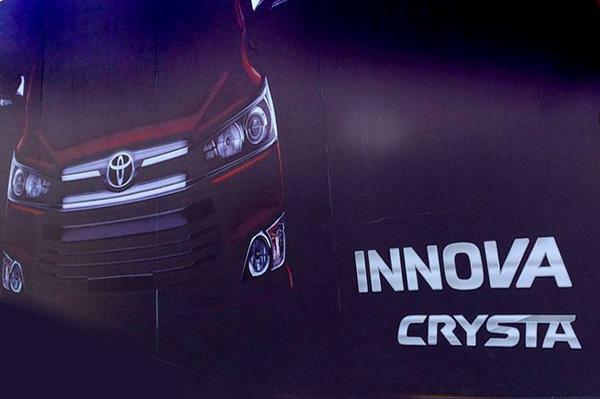 For India, the new Toyota Innova would likely be called as Innova Crysta. The all new Toyota Innova would be getting a big hexagonal grille – with two large chrome slats on top which flows into the headlamps. The car is wider and taller and extends all the way to the base of the front bumper. Talking about the Auto Expo event, conceptually designed as a 3D Wave Dome, the Toyota pavilion will be situated at Hall No 9 at the Auto Expo 2016. Toyota will showcase their exhibits in three separate zones, namely the New Product Zone, Hybrid Zone & Existing Toyota Line-up Zone. The Toyota pavilion will also consist of three corners, namely- New Initiative corner, Services Corner & Safety Corner. Apart from these, Toyota will also be showcasing CSR Initiatives undertaken in the recent times. Toyota will also have an entire zone which is dedicated to hybrid & alternative fuel technology where the automaker would be showcasing Toyota’s cutting edge innovations in both these fields. Toyota is the pioneer in hybrid technology worldwide and has sold more than 8 million hybrid units across the globe. Toyota’s Hybrid cars have received overwhelming responses from the customers and the company has sold over 1000 units since its launch in India last year. – Mr. N. Raja added. At the Auto Expo 2016, Toyota promises to offer its customers an engaging experience and usher in a new motoring experience.